Available in ENGLISH and DUTCH…. On purchase you will receive the following…. Plus…. 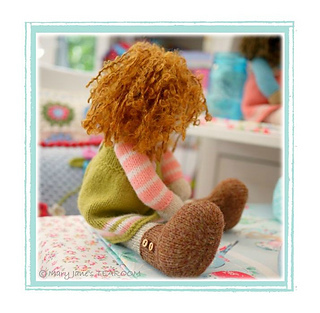 a FREE PDF for ‘A Simply Sewn Pinafore’ which is attached to the download if you would also like to make one for your doll. The pattern includes 4 variations on the original 14” Tearoom Doll design. 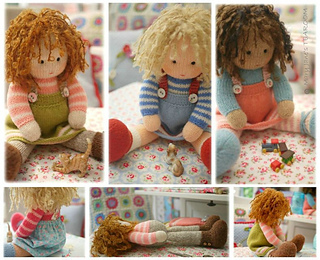 The dolls are structured with flexible joints and can adopt a sitting position with arms forward and legs splayed out. If you use the yarn recommended in the pattern you will need just a 25g ball of each shade (individual shades are detailed with each doll) There are over 220 shades available if you would like to customise your doll. Each doll wears a simple variation of the jumper and pinafore and there are 2 shoe designs (including Mary Jane shoes) and a pair of ankle boots included. 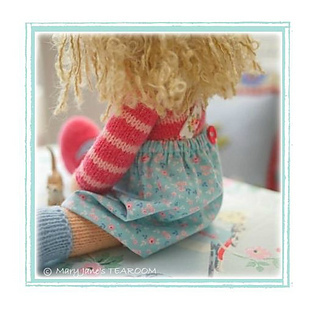 Only basic knitting skills are required to knit the fabric for your doll and the pattern contains almost 50 photographs and lots of written details/ tips to help you put the doll together.